"You need a more mentally challenging job"
Atari 2600 BASIC was programmed by Warren Robinett who is 100x smarter than me and anyone reading this. Well, unless you are him in which case "Hi! Adventure is the greatest Atari 2600 game ever made!". Anyway, since you're probably not him it'll hurt your brain to think about how difficult it was to write a BASIC interpreter for the Atari 2600 that consumed just 64 bytes of memory. Not gigabytes, not megabytes, not even kilobytes - 64 bytes. The Atari 2600 had 128 bytes of RAM and half of that was used for the 64 symbol program you entered so the IDE and interpreter had to be extremely lean. You should now be in awe of this program. Not quite as challenging is writing a useful program in just 64 symbols but that's exactly what I'm going to attempt. Think of all those times you tried to cram your thoughts into a 140 character tweet. Now take away 76 characters and try writing a functional program instead of a description of the burrito you just ate. I own all the pieces required to run this on the original hardware - Atari 2600, BASIC Programming cartridge, and keypad controllers. Setting all this up and using the original controllers is an exercise in frustration. 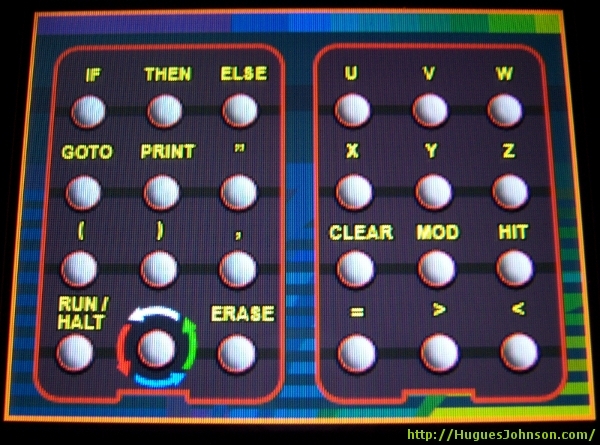 The 24 keys you get on the two keypads aren't enough so there's a toggle system to shuffle between key sets. If that description sounds confusing it's because, well, it's really confusing. It had to be a lot of work to accomplish this and it's sad to think that I'm probably the only person on earth who used it for more than 30 seconds. If you ever feel insane enough to try Atari 2600 BASIC Programming this is definitely the way to go. So you're not going to get a lot of pictures. It's just text and dots anyway, you're not missing much. Alright, on to the programs. I'm not going to include a tutorial or the sample programs from the manual, those are perfectly findable on the Google. Although that only uses five lines it exhausts nearly all available symbols which obviously limits the gaming possibilities. If my previous comment about Twitter and burritos wasn't transparent enough I'll cut directly to the chase - I have a very difficult time imagining a practical use for Twitter. As far as I can tell the main purpose is to feed people's sense of self-importance. It's the modern equivalent of covering your car with bumper stickers. However, this experiment has led me to an almost worthwhile application - sharing Atari 2600 BASIC programs. In any programming language it's an interesting challenge to fit an entire functional program into under 140 characters. The challenge is increased further by preserving space to support # and @ tags. Since Atari 2600 BASIC programs are limited to 64 symbols they will almost always fit into a tweet. The only tricky part is that many of the Atari 2600 BASIC symbols are comprised of multiple characters, i.e. "Goto" is one symbol but four characters. That's OK, we can abbreviate these without changing the functionality of the program. Maybe "worst" was a stretch, this game is arguably better than Troy Aikman NFL Football on the Atari Jaguar. Let's move over to some common math programs that you'd probably have to tackle in your first week of CS 101. -Decimal to hex conversion - I tried about four different approaches and none were close to fitting. -Determining whether a number is prime - similar issues to computing Pi, probably doable for numbers under 10 though. -Any of the Beagle Bros "two-liners", Apple II fans will know what I'm talking about.